MOUNTAIN VIEW, California, July 19, 2018 /PRNewswire/ -- Frost & Sullivan honored recipients at its Excellence in Best Practices Awards Gala on Wednesday, July 18, 2018 at the Loews Vanderbilt Hotel in Nashville TN. Frost & Sullivan's Best Practices Awards are presented each year to companies that are predicted to encourage significant growth in their industries, have identified emerging trends before they became a marketplace standard, and have created advanced technologies that will catalyze and transform industries in the near future. "Awards are presented to companies that inspire growth in their industries," said Art Robbins, President, Consulting & Senior Partner at Frost & Sullivan. "They identify emerging trends before they become the market standard and they create solutions that drive differentiation and sustainable growth. They are the game changers." 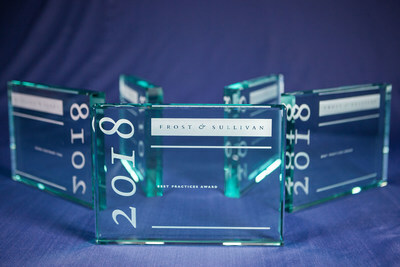 Frost & Sullivan's Best Practices Awards recognize companies in a variety of regional and global markets for demonstrating outstanding achievement and superior performance in areas such as leadership, technological innovation, customer service, and strategic product development. Industry analysts compare market participants and measure performance through in-depth interviews, analysis, and extensive secondary research in order to identify best practices.